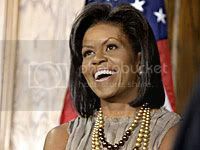 Life As It Should Be: Guys FYI: A Michelle Obama "Chick"
Hey mister men, have you ever thought about the kind of woman you want holding you down when the chips are down? How about a Michelle Obama Chick... someone who can roll with the best of them. She's educated , classy, and is the "rock" of your family. Ever heard the saying, "Behind every great man, there is a great woman." Its' because its true. Your woman, is the one to kick you when you need motivation, love you back to health when you're sick, take care of your children when you want to jump off a bridge and support you in your toughest decisions. At the end of the day, you have got to know that if you can't pull your weight you've got a woman who is not only willing but able.